This course takes place the 2nd Monday of every month. The course is sponsored and held at the offices of Royale Management Services, Inc. located at 2319 N Andrews Avenue, Fort Lauderdale FL 33311. Refreshments and networking will begin at 5:30 PM and the presentation will begin promptly at 6:00 PM. Reservations are Required! 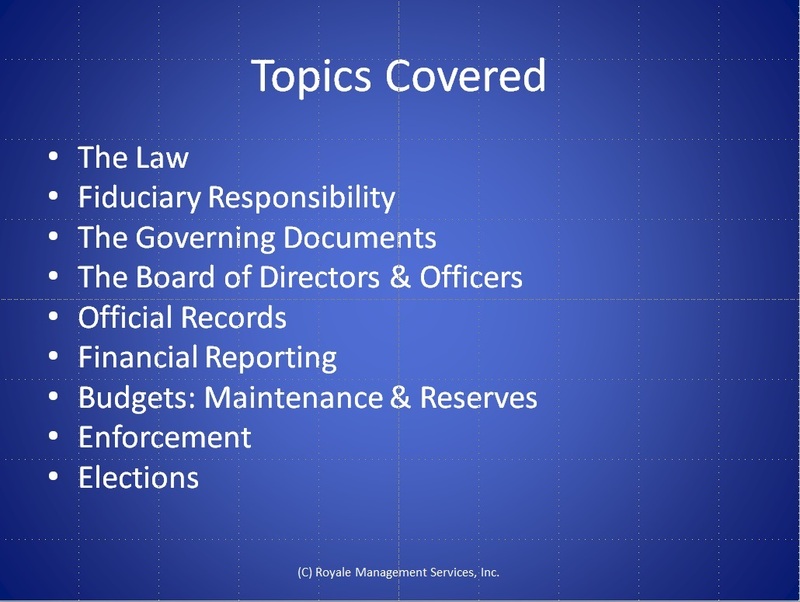 This is a hands on class that will help you understand: the basics of how to keep yourself and your association out of trouble, what’s legal and what’s not, what it means to be a fiduciary, how boards should function, what records must be kept, what kind of financial information you should get, how to use that information and much more. We take a managers approach to getting things done, avoiding problems and protecting both the integrity of the association and that of the board. Best of all we will provide plenty of time for questions and examples. For Reservations call 954-563-1269 between 9AM and 5PM Monday through Friday. Seating is limited so make your reservations early. 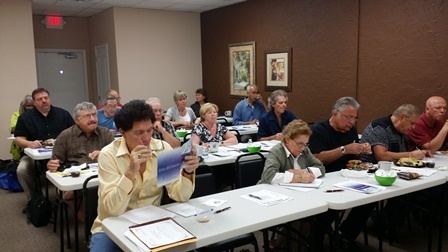 This class meets the Florida state requirements for board certification and has been approved by The Division of Florida Condominiums, Timeshares, and Mobile Homes. It meets the requirements Florida 718.112 for Condominium Association Board Members.